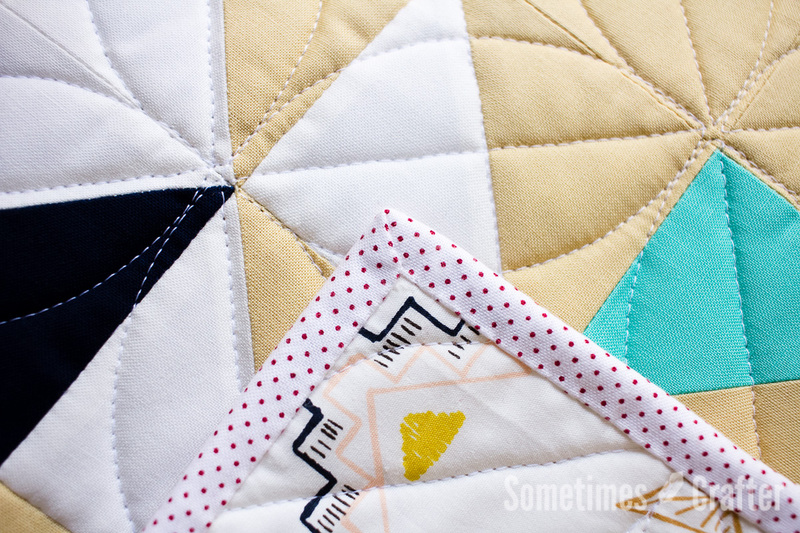 I had a couple of people on Instagram ask me about my mitered corners on my quilts, and how I got them to turn out so “perfect”. Perfect is of course in the eye of the beholder, but I do tend to have nicely squared corners on my binding. It comes from years of practice and perfecting my technique. It’s not difficult, or any big secret, so let’s break it down in photos and then you too can love your mitered corners. First off I want to mention how I hold my quilts when i’m working on binding. This is opposite to how i’ve seen a lot of other quilters hold their quilts. 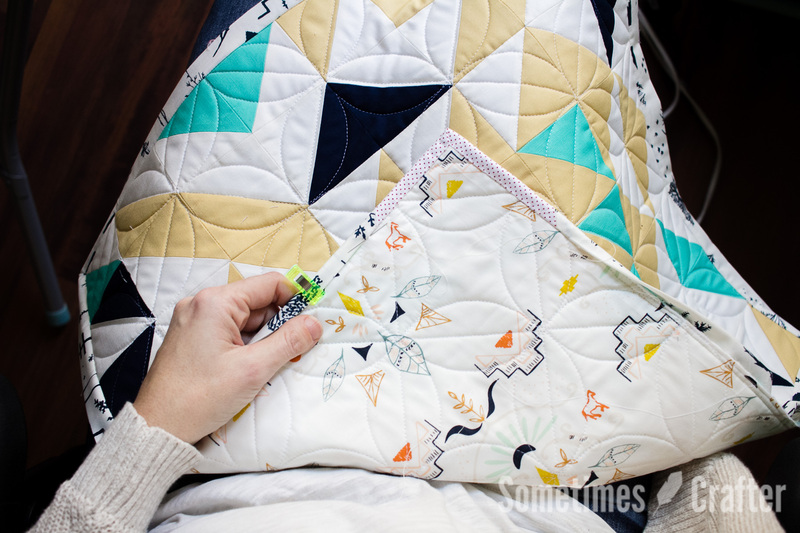 I like to place my quilt in my lap, backing side towards my legs and then I fold up the side i’ll be working on. 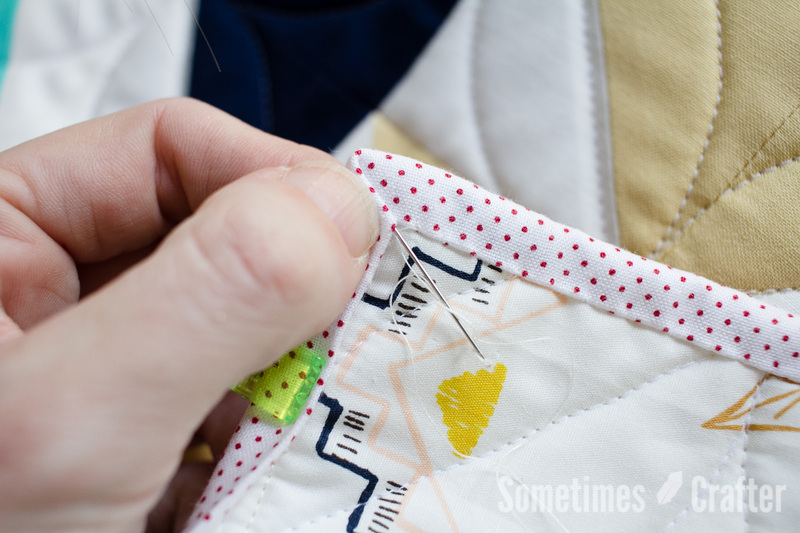 So I am working on my quilt with the binding away from my body, whereas I see a lot of quilters working with the binding towards their body, meaning the quilt top is facing their lap. I’m not sure that this really makes a difference, but it is one of the few things I know I do differently from many quilters. It’s hard to explain in words, but I think you can get the idea from the photo. Something else I do differently than most quilters is I use a blind stitch (vs. an invisible stitch, which really isn’t invisible in my opinion) when I stitch my binding on. I document that stitch in this post. Again, i’m not sure if that makes a difference, but something to try if nothing else is working for you. So, with stitching in mind, stitching your binding along until you reach the corner. 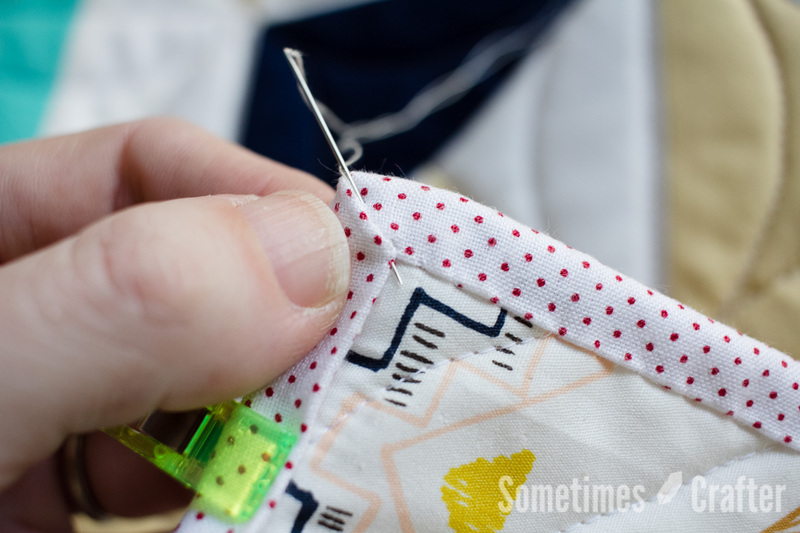 I stitch just right up to my 1/4″ seam allowance from where I stitched the binding to the front of my quilt with my sewing machine. I then do one extra stitch there to hold it. Next, I take a binding clip (you could use a pin if you don’t have binding clips) and I fold over my binding on the side somewhat close to the corner. In this photo it’s about 2″ away from the corner, if that. I don’t pre-clip/pin my binding around my quilt. 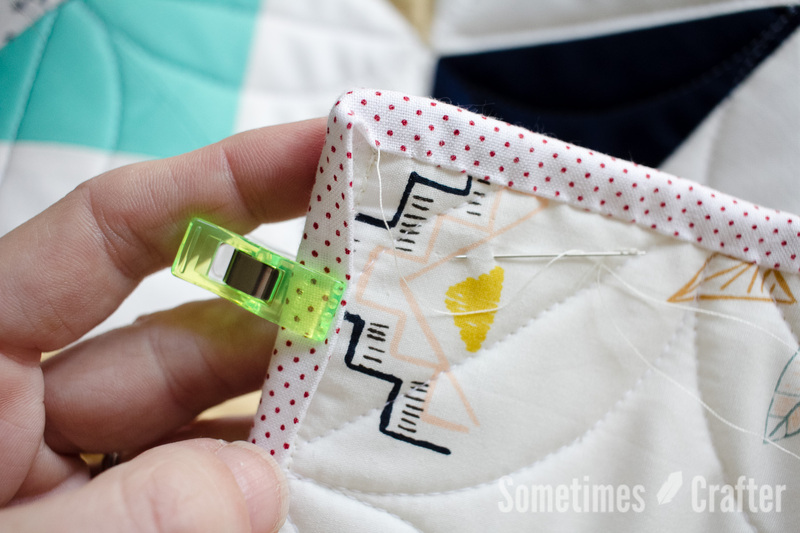 I typically just use this one clip and move it along a few inches as I stitch until I reach it and then I move it along again a few inches. This clip is just me “pinning” my binding in place. Having it folded over also helps me to form the corner without having to awkwardly manipulate the fabric. I then use the needle to push the fabric flat into the fold of the fabric. I just place it down against the binding and then slide it over until it hits the fold and use my thumb and index finger to fold the binding on the left over this. After its folded in there use the point of the needle to adjust/manipulate the mitered fold you just created until it matches up with the binding that’s already been stitched down so that it creates a crisp turn. Holding the folded corner securely with your thumb (or another clip placed right at the corner point) put the point of your needle into the point of this mitered corner and go down into the backing and batting (not the quilt top) and rock back up a very small distance away through the mitered fold. Continue up the fold, using a blind stitch in the fold and going through the binding under the fold. You want to secure the corner. 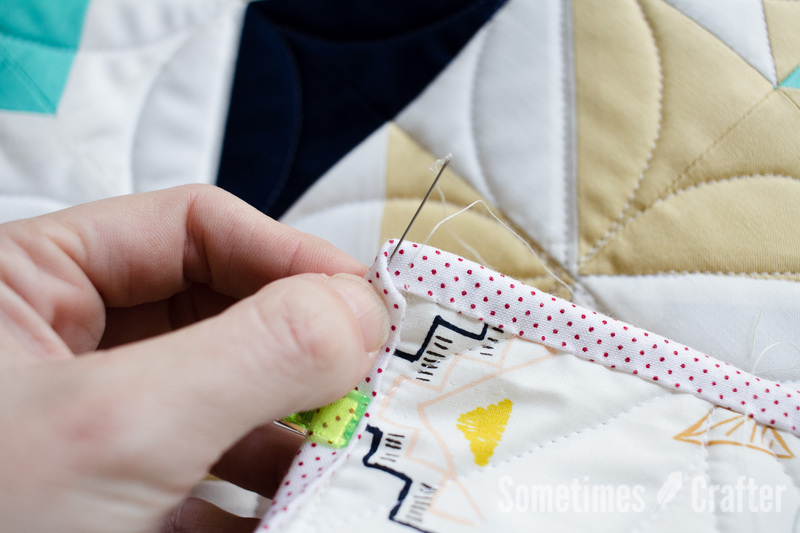 Once you’ve stitched as far as you can along that fold flip your needle around and come back through the binding out at the point where the binding meetings at that 90-degree angle. 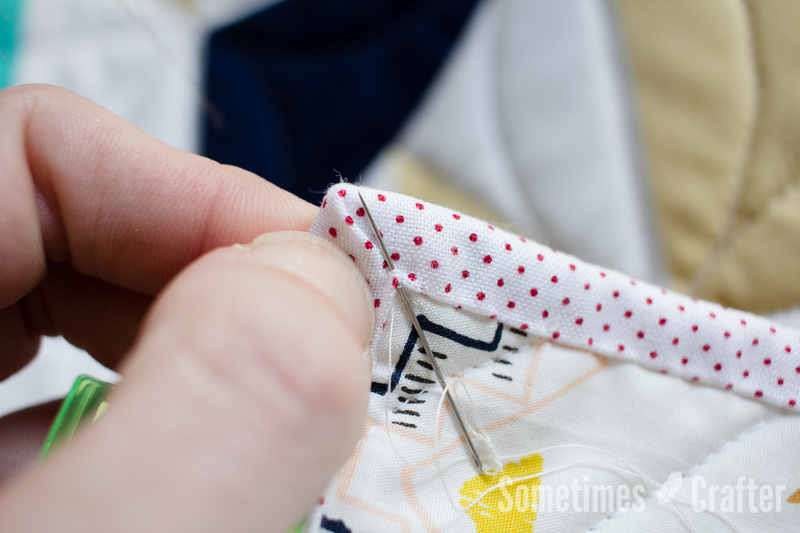 Continue stitching down your binding until you reach your next corner. At this point I take the time to rotate my quilt around in my lap so that I can work from right to left on my binding, instead of top to bottom as it would be oriented at this point. So that’s it, nothing terribly tricky, just taking my time and being mindful of what i’m doing. I’m with you. I hold my quilts the same way – I just can’t get that hang of it any other way. I finish my corners the same way too – but it’s really tough on my thumbs! I hold them that way too! I also do my corners exactly like you. Thx for the tutorial. 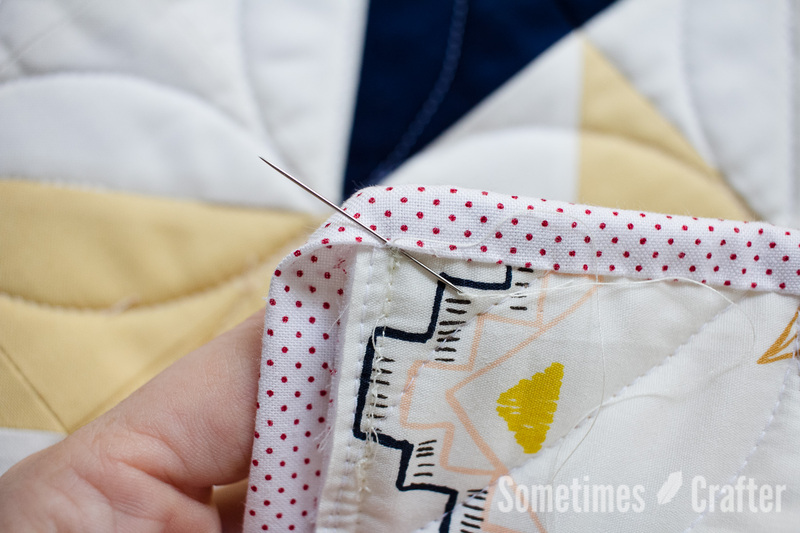 I usually glue baste my quilts and sew the opposite way. My corners turn out good but I will give this a try. Thank you for this post. It is so clear and understandable with the pictures as a guide. I am a beginner novice. I have done a few quilts, but I still struggle with techniques.